Original Whirley Pop Stovetop Popcorn Popper: Make delicious homemade popcorn in just 3 minutes! 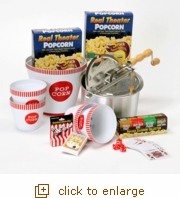 Two Real Theater All-Inclusive Popping Kit 5-Packs: Simply cut, pour, pop for great movie-style popcorn! On the Edge Seasoning Set:Step out of your comfort zone and try something a little edgy...set includes 4 jars (1 oz. each): Ooh La La French Toast, Lip Smackin' Baby Back Ribs, Yes Ma'am Ketchup Please, and Dough Ra Me Chocolate Chip Cookie Dough. Large Red & White Striped Bucket:Bucket holds approximately 6 quarts of popcorn and features a kernel separator. Measures 9" across and 8" tall. 4 Small Red & White Striped Buckets:The perfect size for small hands smaller servings! Holds approximately 2 cups of popcorn and includes kernel separator. Measure 5" across and 4.5" tall. Playing Cards & Dice:Spice up game night with our standard deck of popcorn-themed playing cards. Set also includes dice. - Popping with American Pride.